Miso soup is made by mixing miso paste (a traditional flavoring) and dashi (stock). The paste is made by fermenting soy beans, rice or barley, and salt. There are different kinds of miso depending on the region, just like there are different varieties of cheese. The most common type of miso is a light brown color, although there are also some that are pale yellow and others that are dark brown. The soup can be prepared with vegetables, meat, fish, tofu, or any combination of these. 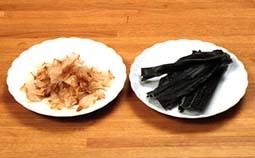 Dashi is stock generally made from konbu (kelp), dried bonito (a kind of fish) flakes, or both. To complement the taste of the miso, strong-flavored stock is used. Bonito flakes are now available outside of Japan, so try making dashi with them. Bring water to boil. Add bonito flakes and wait for the water to boil again. Turn off the flame and remove the flakes with a strainer. The dashi will look like this. Concentrated stock is available at stores selling Japanese foods in granular, powder, and liquid form. You can use these, too, if you can get hold of them. While the amount you use will be different according to the type of dashi, figure on adding around two teaspoons for around three cups of water.